I embrace being left handed. Growing up my family was half lefties and half righties. There are family and friends who didn’t know I was left handed. I thank left handed people are unique. 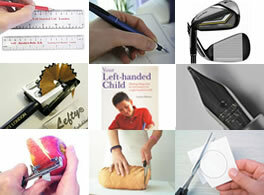 Happy left handed day ! I feel proud for my daughter as she us left handed. She’s very smart. The best part of being a left-handed, is the lefthanders day is on my birthday. I am a Lefty, and at the age of 37, I have finally decided to embrace this difference and appreciate it for what it is! Rare awesomeness!! I need some clarification whether I am actually Cross-dominance or Mixed-handed. 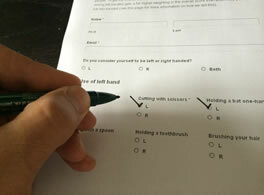 Apparently Mixed Dominance is different to Ambidextrous, which is the equal ability to use both hands, this is not me….. I do precision with my left and sport right-handed, I would have played guitar right-handed if I had of been handed a left-handed guitar…. The stats are that Cross-dominance or Mixed-handedness is the change of hand preference between tasks. This is uncommon in the population with about a 1% prevalence. I think is pretty cool…….! I am really to happy to have join you guys and look forward to the 13th of August!! Left is always right, lol! 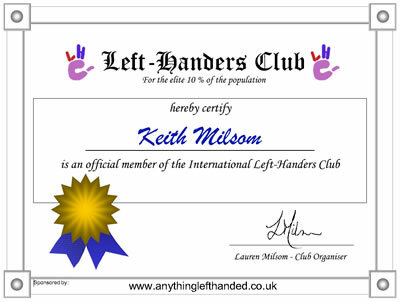 I’ll be hanging my certificate up in the office with pride! Am left handed and my first born is left too but,aged 10 years.Can she be a member too?